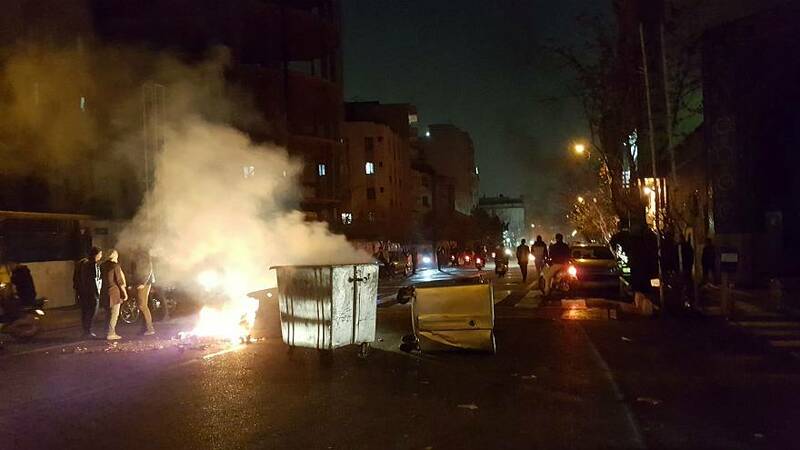 Reports from Iran suggest some of Saturday’s anti-government protests in several cities have turned violent. There are unconfirmed reports of deaths in the western town of Dorud, while violence has also been reported in Abhar in the north, and in Arak in central Iran. Videos posted on social media showed two men lying motionless on the ground and covered with blood. The origin of the videos has not been confirmed, and neither have the early reports of casualties. However, it is believed that there have at least been injuries. In Tehran, large numbers of people were said to be gathering in a main square on Saturday evening. Reports said many people were losing internet access on their mobile phones. It's understood that Telegram Messenger suspended part of its service after its founder, Russian entrepreneur Pavel Durov, received a warning from Iran's Information Minister about messages allegedly containing incitements to violence. Earlier in the day, police in the Iranian capital dispersed crowds of young people near the university with tear gas. The protests against Iran's Government were taking place in the country's major cities for the third day in a row. Marchers were seen shouting slogans against Supreme leader Ayatollah Ali Khamenei. In clips posted on social media, crowds were seen chanting and throwing missiles outside university gates in Iran's capital Tehran. Police made dozens of arrests and reportedly used tear gas and violence to disperse demonstrators. The protests, which began in north east Iran on Thursday, are against rising prices, alleged corruption and the country's costly involvement in regional conflicts such as Syria and Iraq. The government's warning people to stay away from what it calls 'illegal gatherings'. On social media, the US has defended the protests, with President Donald Trump warning Iran's Government 'the world is watching'. The Department of State also tweeted its support and urged other nations to do the same. Earlier on Saturday morning, Iranian state television showed thousands gathered in Tehran and other cities to support their Supreme Leader Ayotallah Ali Khamenei. State television showed the rallies in Iran's capital and its second largest city of Mashhad. The demonstrations against the government are the most significant since 2009, when masses came out in support of then-president, Mahmoud Ahmadinejad, after reformists disputed his election victory.